Sep 1 . Seabees and 6- 5" guns arrive Guadalcanal. Sep 2 . UnderSec James Forrestal visit ; returns to DC calling for support for Guadalcanal. Sep 3 . Japanese minelayer is damaged by aircraft in Solomons area. Sep 4 . Gregory (APD-3) and Little (APD-4) are sunk by Japanese destroyers off Lunga Point, Guadalcanal. Sep 5 . Japanese Army though Owen Stanley Gap and start down to Port Moresby, New Guinea. Sep 5 . Japanese troops are withdrawn from their tenuous beachhead at Milne Bay, New Guinea. Sep 6 . Duel between flying boats : PBY downs the Kawanishi. Sep 7 . Army loses 11 of 14 P-400 in three days. Sep 8 . Edson's Raiders destroy artillery dump. Sep 8 . Nine planes crash on mud soaked air field. Sep 9 . Reconn seaplane from Japanese submarine I-25 drops incendiary bombs near Mount Emily, Oregon, in an attempt to ignite forest fires. Sep 10. Japanese submarine I-30 returns to Singapore from Lorient, France, having successfully run the Allied blockade. Sep 11. Last of 6,000 Japanese troops landed Guadalcanal in two week period. Sep 12. Enterprise (CV-6) heads to Pearl after temporary repairs at Tongatabu. Sep 12. Wasp (CV-7) delivered aircraft to Henderson Field. Sep 12. German U-156 torpedoes British transport Laconia, which has 1,800 Italian POWs on board. Open and diplomatic calls for aid, rescue begins. Sep 13-16. Marine Battle of Bloody Ridge defends the beachhead. Sep 14. 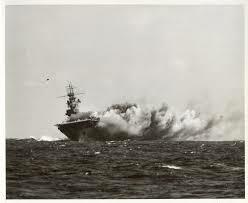 AAF planes sink Japanese ammunition ship off Kiska, Aleutians, damage 2 subs. Sep 14. 7th Marine division sails from Espiritu Santo for Guadalcanal. Sep 14, Armies of Nazi Germany began siege of the Russian city of Stalingrad. Sep 15. Wasp (CV-7) sunk by three torpedoes from I-19 pic ; N Carolina (BB-55) damaged and O'Brien (DD-415) sinks later. Sep 15. Japanese battleships bombard Guadalcanal. Sep 15. Beginning of the siege, Battle of Stalingrad, lasts 4½ months. Sep 16. Hornet (CV-8) is the only carrier in service in the Pacific. Sep 16. Laconia Incident : USAAF B-24 bombs German submarines rescuing survivors of the British Laconia. Sep 17. Guadalcanal beachhead is 5 miles by 2½ miles deep. Sep 17. Japanese overland assault stopped at Ioribaiwa, within sight of Port Moresby, New Guinea. Sep 17. Adm Doenitz forbids U-boats from rescuing survivors of sunken ships : the "Laconia Order". Sep 17. Leslie Groves promoted to Brigadier and takes over Manhatten Project to build a bomb. Sep 18. Japanese Army in NG, starving, starts withdrawal over Owen Stanley Mountains. Sep 18. 7th Marines, 4,180 men, land on Guadalcanal bringing total to 22,500. Sep 19. Nights are 12 hours long, allowing Japanese DD transports protection from SBD's. Sep 20. Liberty ship production achieves level of sinkings. Sep 21. Saratoga (CV-3) arrives Pearl Harbor for repairs from torpedo. Fletcher to DC on leave having sunk six aircraft carriers. Sep 22. Radar installed on Japanese carrier Shokaku. Sep 23. Marines start move through interior to Matanikau River. Sep 24. Japanese land on Mariana, Gilberts. Sep 24. US planes damage Japanese resupply destroyer and seaplane carrier. Sep 24. Crews from each end of Alaska Highway meet. Completed 28Oct42, dedicated on 20Nov42. Sep 25. Japanese land on Beru, Gilberts. Sep 26. First Marine offensive action fails at Matanikau River. Sep 27. Japanese land on Kuria, Gilberts. Sep 27. S.S. Stephen Hopkins, a Liberty Ship, engaged German raider Stier in Atlantic ; each was sunk. Sep 28. Of 62 Japanese planes attacking Guadalcanal, 23 shot down with one U.S. lost. Sep 29. Reconn seaplane from Japanese submarine I-25 bombs forest in Oregon with incendiaries.